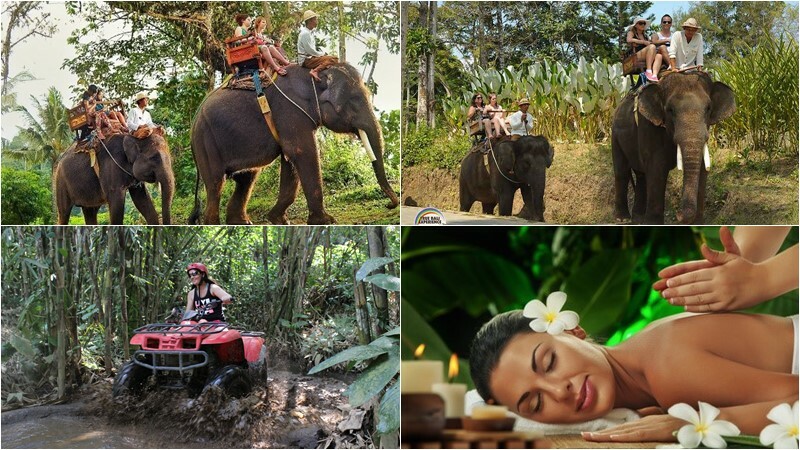 BCD-103: Atv Ride + Elephant Ride +Spa. Morning depart from your hotel, drive via the village and some country side, then we will arrive at the Atv ride location, get the welcome drink and registered your name. Please wear short or loose pants for the easy movement, boots, helmet, towel, shower facilities is provided at the location. Then… lets start the Atv ride adventure for 1,5-2 hours, pass the village, jungle garden and wet mud trek, this ride will pumped your adrenaline. after ride, take shower, change and shower and followed by lunch time. Afterward trip continue to visit Bali Elephant Camp at Carangsari village where we will ride the biggest creature on the earth…. The Sumatran elephants ready to welcome you, after registered and get welcome drinks, our staff will directed you to the high huts where we will start the Bali Elephant ride journey. They will take you for 30 minutes ride pass the tropical garden with Manggo tree, Jack fruits, Durian, Bamboo, coconut and clove tree, see the fields and sometime the elephant stop for get bonus sweet fruits form the keeper while take you on ride, please Look down to ayung River valley and listen nature sound, wind breezing, and experience how much fun on elephant ride. Our elephant will take you walk into the deep pool, spouting water from his trunk and finally complete the journey. If you want stay bit longer, you may take look at Honey bear cage or walk down to Chocolate ground factory just to see how it is…. After ride, trip will continue to have an experience with 2 hours spa package treatment; Foot wash, Balinese body massage, body scrub and aromatic flower bath. Its one of the most pavorit adventure which is must be try during your stay in Bali, Bali driver will be with all the day till all program is done. 10.00 –Join Atv ride for 1,5-12 hours trek. 12.00 – Finish ride, shower, change and lunch. 13.30 – Visit Bali Elephant Camp for 30 minute elephant ride tour. 16.30 -Enjoy 2 hours spa package treatment. Child be tanden atv ride with parent.